Sri Lanka unexpectedly threw the VB Series wide open with a 94-run win over South Africa at the Gabba in Brisbane. Kumar Sangakkara's 88 from 109 balls set Sri Lanka, who lost their first match to Australia, on their way to 282-6 from their 50 overs. Sangakkara and opener Jehan Mubarak (61) put on 112 for the second wicket. Substitute Malinga Bandara, Chaminda Vaas and Muttiah Muralitharan claimed most of the South Africa wickets, whose top scorer was Mark Boucher with 62. 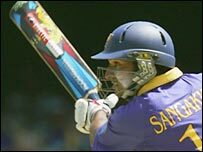 Sri Lanka, who were put into bat by South Africa after Graeme Smith won the toss, were given an excellent foundation by Sangakkara and Mubarak. They batted together for 18 highly productive overs before Mubarak was trapped lbw by off-spinner Johan Botha (2-49). Sangakkara was the fourth man out with the score on 211 in the 39th over, leaving skipper Marvan Atapattu (33 not out) to marshall some steady accumulation from the lower order. The target was certainly achievable, but South Africa lost four wickets before registering their 100 and failed to convince at any stage of their reply. The star of the bowling show for Sri Lanka was leg-spinner Bandara, who took 3-31. South Africa lost both openers cheaply and tossed away two more wickets with run-outs. Ashwell Prince was first of Bandara's victims, caught by Nuwan Kulasekara after making a ponderous 29. Dangerman Justin Kemp was next to fall, failing to connect with a big swipe as the ball ran on to hit leg stump. And Bandara also took the final wicket of the match, when Boucher lobbed a catch to Tillakaratne Dilshan. Only Boucher and Jacques Rudolph (53) had made any kind of impression with the bat for the losing team. The VB Series is now finely in the balance with Australia, Sri Lanka and South Africa all having played two matches and won once. Australia face South Africa in Melbourne in the fourth match of the series on 20 January. South Africa: G C Smith (Capt), H H Dippenaar, H H Gibbs, J Botha A G Prince, J M Kemp, M V Boucher (Wkt), S M Pollock, A J Hall G J P Kruger, M Zondeki, Sub: J A Rudolph. Sri Lanka: W U Tharanga, J Mubarak, K C Sangakkara (Wkt) D P M D Jayawardene, M S Atapattu (Capt), T M Dilshan, R P Arnold W P U J C Vaas, C R D Fernando, P D R L Perera, M Muralitharan Sub: C M Bandara.